The Vincent Price Art Museum became a collecting institution in 1957 when Vincent Price and his wife, Mary Grant Price, donated 90 artworks from their personal collection. This original donation included Mesoamerican, African, Native American, and European artworks; over the course of four decades, Vincent Price continued to give a total of about 2,000 pieces to VPAM. His generosity inspired many others: our collection has grown to more than 8,000 artworks from many time periods and many parts of the world. The collection includes works on paper, painting, and three-dimensional objects, all of which are housed on the campus. A few of the artists represented in our far-ranging collection are Raúl Angiano, Don Bachardy, Rafael Coronel, Gronk, Rico LeBrun, Andre Miripolsky, Kate Steinitz, Patssi Valdez, Howard Warshaw, Charles White, and Milford Zornes. There is currently one exhibition drawn from our permanent collection on display located on the third floor. 1 See Mary Ellen Miller, The Art of Mesoamerica: from Olmec to Aztec, London: Thames & Hudson, 2006. 2 See Rebecca Stone-Miller, Art of the Andes: from Chavin to Inca, London: Thames & Hudson, 2002. The pre-Columbian collection is comprised of more than 100 art objects with a concentration in ceramics. Most objects are from West Mexico, a region that includes the current states of Nayarit, Jalisco, and Colima; other areas of origin are Teotihuacan and the Andean region. The earthenware includes bowls, figures, and votive heads. 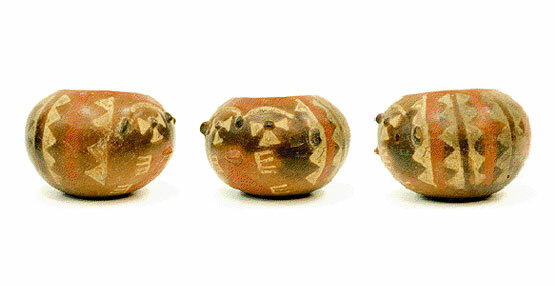 Notable Andean vessels range from the Moche to Chancay cultures. Other materials contained in the collection are shell, stone, and textiles. Several donors have contributed to the pre-Columbian collection. Vincent Price himself set it off with a substantial and varied bequest. Price began to donate in the 1950s, a time of rising international interest in pre-Columbian art. These ancient objects became popular in various collections and debates about their artistic value ensued. Price’s contribution would total almost 40 objects and include most of the Andean artworks in the collection. Other donors include: Mr. & Mrs. Bruce Throckmorton, Caroline Tupper, David & Steven Morehouse, Larry Booth, Daniel Melnick, Thomas Silliman, Robert Grimes, and Ralph & Catherine Benkaim. Pot, ca. 500 B.C.E. – 0 C.E. The red geometric slip design in this pot exemplifies that of many vessels produced in Chupicuaro. Ceramics from Chupicuaro typically have simple rectilinear patterns, triangles being a favored shape. The triangular strips in this piece are reminiscent of those found surrounding the prominent Chupicuaro diamond-shaped motif. In 1969 VPAM had an entire exhibition dedicated to ceramic pieces from Chupicuaro. 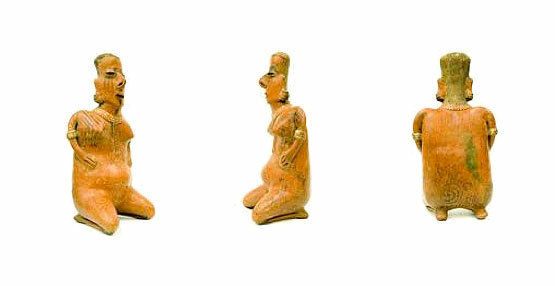 Female Figure, ca. 100-300 C.E. This figure from Nayarit shares characteristics with other figures from West Mexico, such as its flatness and slab-and-appliqué technique. It is common to find male-female pairs with a similar style in Nayarit. West Mexico is an area where a significant number of ancient objects have been located. Unfortunately, in the past, many pieces were removed from their original site without thorough analysis; hence their provenance is often uncertain and documentation is frequently lacking. There are similarities between some of these West Mexican objects and Andean ones, suggesting the possibility of contact between the distant civilizations or simply indicating similar contemporary needs. These resemblances are apparent in the form and design of certain ceramic pieces. The Chimu culture predominated during the Late Intermediate Period (AD 900-1400). 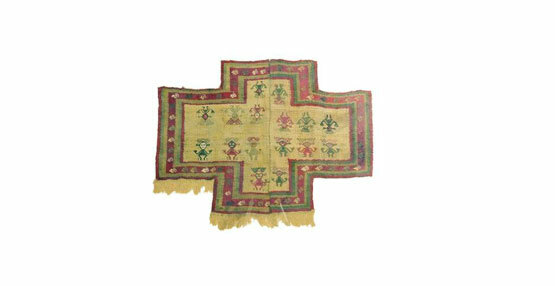 They are renowned for their architecture but also produced notable textiles. Chimu textiles share a few traits with the various art forms of this culture, such as using piecemeal production and working on a large scale. Moreover, the patterns were similar to those carved on walls. The preferred material for textiles was white cotton rather than camelid fiber and a favored motif was a monkey figure (present in many Andean artworks). Vessel, ca. 180 B.C.E. – 500 C.E. 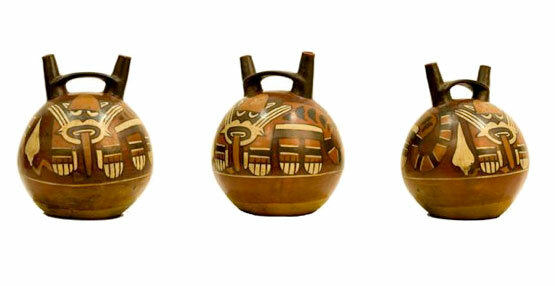 The rounded shape, glossy finish, and wrap-around motif of this double-spout-and-bridge vessel are characteristic of the Nazca style. Handicrafts such as coiling most likely achieved the thin, even walls. Having the painted design wrap around a vessel is a trait that is still present in Peru. Nazca ceramics are considered to be the peak of Central Andean pottery, reaching an unprecedented level of sophistication in both shape and composition. This climax is also marked by the variety of color used, which was unique to the region. You can view a representative sample of the pre-Columbian collection in our ongoing Form and Function in the Ancient Americas exhibition located on the third floor of the museum.